Published: April 10, 2019 17:24 Pratyush Sarup, Special to tabloid! Milan Design Week revealed the coming together of some of the most exciting light brands with some seriously talented designers from around the world. Best known for immersive installations such as his giant sun at the Turbine Hall at London’s Tate Modern or the rainbow-hued glass corridor at the ARoS Aarhus Kunstmuseum, the Danish-Icelandic artist is known for using light as a medium to explore space and the human scale. When Poulsen invited him to design a lamp, it offered Eliasson the opportunity to flex his creative muscle in a new direction — creating for everyday use, something that would work outside the context of a gallery. With OE Quasi, he achieves exactly that. An encased, glowing orb, the lamp’s exoskeleton is made of 90 per cent recycled aluminium and in the truest sense of cyclic economy, allows for future disassembly and also reuse. Eliasson wanted to design a lamp with presence, very much along the lines of the Poulsen icon, Henningsen’s ‘Artichoke’ light. 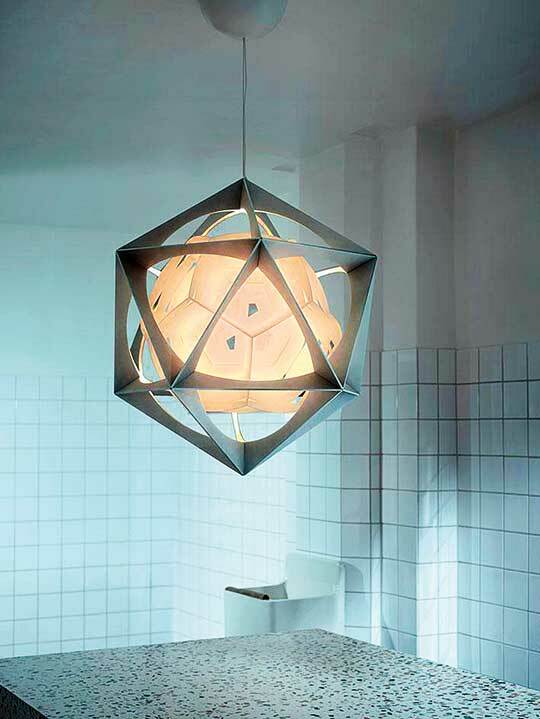 By reversing the usual codes of lighting design where a soft shell usually conceals the metal frame, the artist’s vision to encase a glowing white polycarbonate dodecahedron inside a solid structure brings to light what is usually hidden in spectacular style. Blimp, the cloud-like crystal lighting collection designed by the Swiss studio Big Game embodies the monumental stance of its namesake airship — and yet delivers a sense of lightness and effervescence. Airy, and with a wave-like silhouette, the lighting collection that encompasses proposals for the wall, table, floor and suspension from the ceiling demonstrates a distinctly contemporary application of the skills of Bomma’s glassmakers. 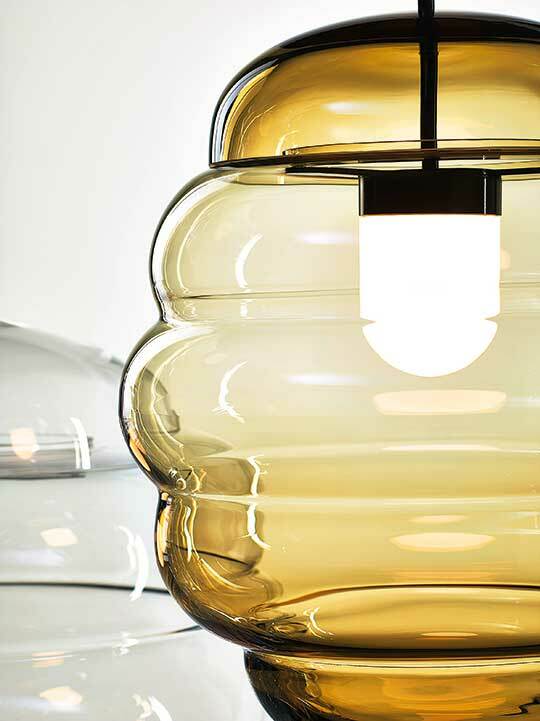 Available in clear or amber glass and across three size modules, with the largest being one metre for pendant lights, Blimp celebrates both the technical and human possibilities within the hand-made crystal world that still relies heavily on classical approaches to technique and design. Alongside Blimp, and drawing inspiration from a diverse universe that included colourful beads, viewing lens and Newton’s Cradle, the Czech brand also introduced collaborations with Studio deform and Boris Klimek amongst others. 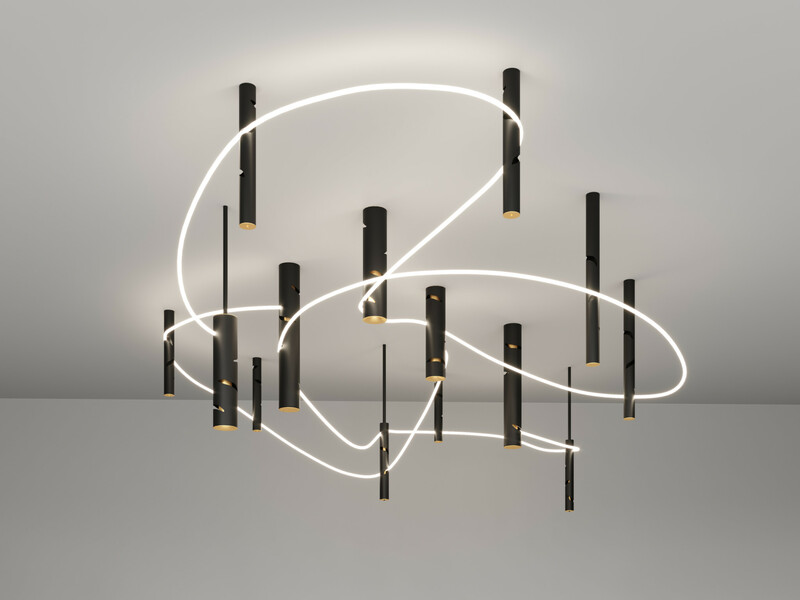 The Dubai-based designer marks her first collaboration with the Italian lighting brand with a modular lighting system, Interweave. A meeting with Carlotta de Bevilacqua, Vice President and CEO of Artemide at Downtown Design 2018, led to a series of discussions that birthed this collection that serves as a metaphor for connecting cultures, people and creativity. Fixed to the ceiling or to the wall, hollow cylinders with several sinuous holes guide a flexible LED light line, allowing the end user to create their own soft and unexpected geometries. From the number and positioning of the cylinders, to the expanse of the composition — the light line comes in five-metre extensions. Interweave offers endless flexibility. Add to that the option of housing spotlights, intelligences and devices such as speakers and sensors in the cylinder; our perception of ceiling design stands to be truly altered by Interweave. 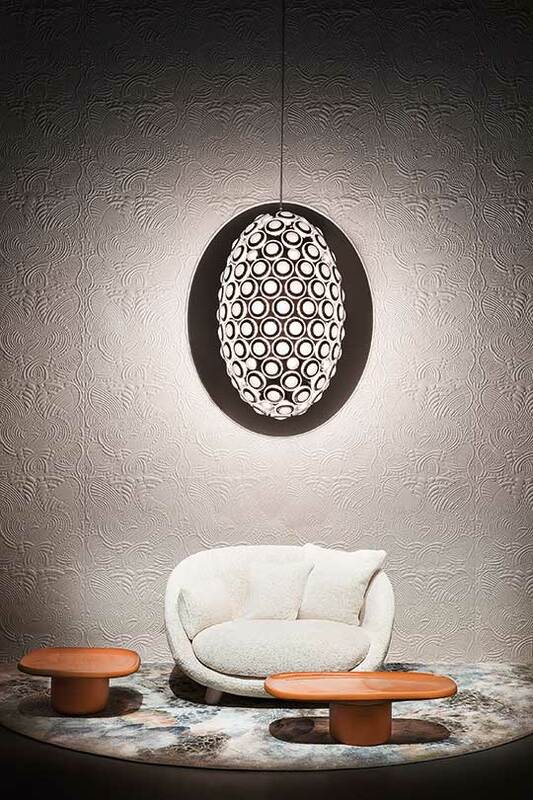 Iconic Eyes, the first collaboration between Munich-based lighting designer and superbrand Moooi was born from coincidence. The idea for this suspended light came to be when Dessecker was approached by Munich’s Bavarian National Museum to design a bespoke lighting solution for their foyer. At the same time, he also received a box of headlights from BMW, also based in Munich, asking him if he would be interested in creating a light object made from pieces of BMW headlights. Dessecker eventually sent photographs of the one-off pieces installed at the museum to Marcel Wanders, the founder of Moooi. Seeing the commercial and scalable potential in the prototype, he presented Dessecker with the recourses needed to develop a lighting collection that was as close as possible to the museum light, only bigger and with a longer life in production.